High Quality Content by WIKIPEDIA articles! High Quality Content by WIKIPEDIA articles! 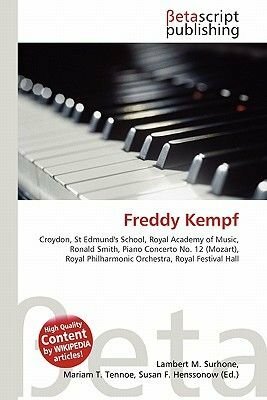 Freddy Kempf is a pianist born in Croydon in 1977 to a German father and a Japanese mother. He now lives in Berlin.He was educated at St Edmund's School, Canterbury and the Royal Academy of Music. He now lives in Berlin. Taking up the piano at the age of four under Ronald Smith, Kempf first caught the attention of British concertgoers four years later when he played Mozart's Piano Concerto No. 12, K. 414, with the Royal Philharmonic Orchestra at the Royal Festival Hall. The child virtuoso was shortly invited to Germany to repeat his performance. In 1987, Kempf won the first National Mozart Competition in England and in 1992, was named BBC Young Musician of the Year for his performance of Rachmaninoff's Paganini Rhapsody. He won the Young Concert Artists International Auditions in 1996 which led to his New York City recital debut at Carnegie Hall.